Israel uses military force and technology to maintain its system of military occupation and apartheid. Israel’s violations of international law and war crimes during its frequent attacks on Palestinians are well documented. Israel is only able to act with such impunity because governments, companies and research centers cooperate with and support its military and security industry. Palestinian civil society is calling for a comprehensive military embargo on Israel to end all this cooperation. This will hold Israel accountable for its crimes and help end them. To reach this goal we must deploy a variety of strategies, including direct action, lobbying and grassroots campaigning. Amnesty International and several local governments around the world are calling for an end to the arms trade with Israel. International corporations and governments are enabling Israel's attacks on Palestinians through their support of Israel's military industry and research facilities. Between 2009-2018, the United States gave $30 billion in military aid to Israel. Private companies and governments, including UK, the Spanish State, and Italy export weapons to Israel. The EU funds research of Israeli military companies. Israel is one of the biggest arms producers in the world and heavily depends on exports. Up to 70 % of Israel’s military production is exported, mainly to the Global South and particularly to rogue and authoritarian regimes which use it to commit genocide, ethnic cleansing and other grave human rights violations. Israeli military companies use attacks on Palestinians to test new weapons and military technology. Israeli weapons companies market their weapons as “field-tested”. Israel causes harm by exporting its repressive tactics and technologies. Its exports are used to build walls, promote surveillance, enable racial profiling and racist police repression, and to violate the rights of indigenous peoples, migrants and human rights defenders. In 2018, Israeli soldiers murdered over 170 unarmed Palestinians and severely injured thousands living under a brutal siege in Gaza as they peacefully protested for their freedom and their right as refugees to return to their homes. 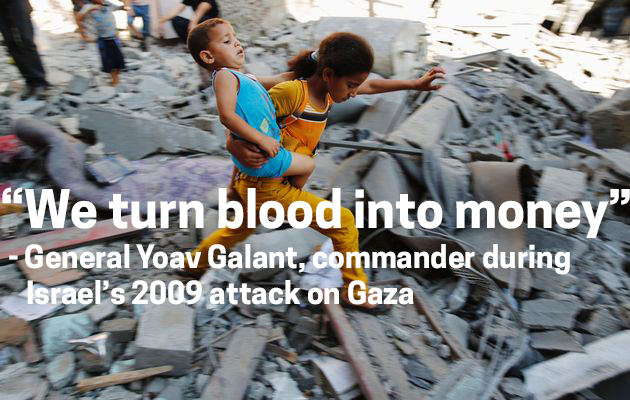 In 2014, Israel’s army attacked Gaza and killed over 2,200 Palestinians, including 500 children. In 2008-9, Israel killed over 1,400 Palestinians in a similar military assault that lasted 23 days. Israel has used illegal military tactics and prohibited weapons, such as cluster munitions, in its attacks. Israel has adopted rules that allow soldiers to shoot to kill or maim Palestinian protesters. Approximately 20 % of Palestinians in the occupied West Bank and Gaza Strip have been detained by Israeli forces since 1967. Collective punishment, extrajudicial killing and detention of Palestinians without trial are common practices. Israel’s Supreme Court has de facto legalized torture. Repeated Israeli military aggression against neighboring countries has caused tens of thousands of casualties in the region. These practices are facilitated by Israel’s system of law enforcement, security and weapons industry, which includes Israel’s police, prison services, Israel’s secret services and thousands of private weapons and cyber security/intelligence companies. Israeli universities and research institutes contribute to the development of weapons and surveillance technology and techniques, as well as doctrines of repression. 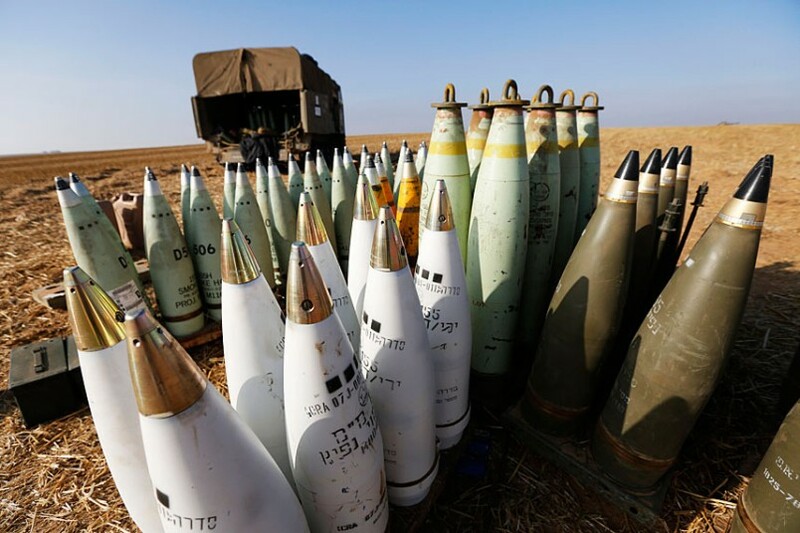 Israel's use of proscribed weapons, such as white phosphorus, has been documented. Military aid and exports to Israel sustain Israeli apartheid and enable its oppression and war crimes against Palestinians. The United States is set to give Israel $38 billion in military aid between 2019-2028, providing 18.5 % of Israel’s annual military budget. Much of this aid is used to purchase weapons and equipment from US companies. In 2012-13, EU countries granted licenses for military exports to Israel totalling €983 million ($1.1 billion). Between 2014-2018, the EU has funded over 200 joint research programs, worth €452.3 million, with the participation of Israeli military companies. Virtually all of the world’s major arms companies do business with Israel, including BAE Systems, Raytheon, General Electric and Lockheed Martin. Transnational companies such as G4S and HP act as private contractors who provide services to maintain Israel’s regime of military occupation and apartheid. Bulldozers produced by international manufacturers destroy Palestinian homes and communities. 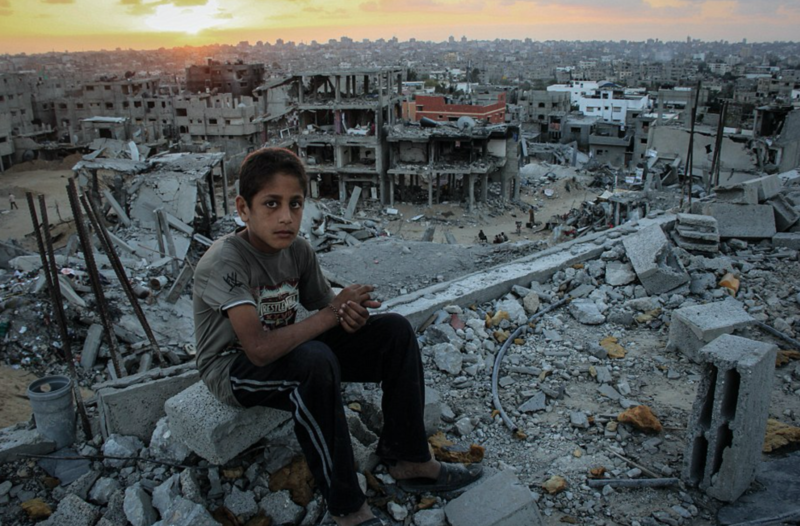 A Palestinian boy sits on the rubble of a destroyed building, overlooking the destruction of Gaza in Israel's 2014 attack. Israeli military exports totaled an unprecedented $9.2 billion in 2017. Israel is currently the world’s eight largest arms exporter, with a growth of 55 % during the last five years compared to the previous five-year period. The majority of Israel’s military exports are sold to the Global South. In 2017, India absorbed 49 % of all Israeli weapons exports. Military exports fund Israel’s military and security industry and provide substantial revenues for the Israeli state, which are partially used to finance more oppression of Palestinians. Israel experimented with new drones while it massacred peaceful Palestinian protesters during the Great March of Return in Gaza. Israeli military companies market weapons as ”field tested,” i.e. tested on Palestinians, and they boast about growing sales following military assaults on the Palestinian population. This constitutes a strong financial incentive for Israel to continue its oppression and war crimes against Palestinians. Military embargo campaigns are making a dent in Israel's military profits. Military exports to Europe have declined over the last decade forcing Israel to pursue new contracts in the European anti-migration policies. Israel’s militarized police force controls civilians through repressive, racist policing and surveillance tactics. It dangerously erases the distinction between a civilian population and combatants, turning entire communities and any opposition into “enemies,” who can be targeted indiscriminately. Israel’s police plays a central role in enforcing the growing number of Israel’s apartheid laws that target Palestinian citizens of Israel. It also assumes the role of the army in enforcing Israel’s illegal annexation of occupied East Jerusalem, systematically demolishing Palestinian homes, forcibly expelling Palestinians from their city, imprisoning Palestinians without due process, and carrying out torture and extrajudicial executions. Israel’s border police is directly responsible for enforcing the military occupation in the West Bank. It runs Israel’s military checkpoint system and carries out raids and invasions of Palestinian villages. Israel has supplied 61% of the world's drones since 1985. Israel is not just oppressing Palestinians. Israel's military, police and security firms market their military assault techniques and population control technologies to promote a ruthless model of surveillance and repression around the world. Israel is deeply involved in training and arming death squads in Latin America. Israel has sold weapons to regimes accused of genocide, including to Myanmar during its persecution of the Rohingya, and Rwanda during the genocide. Israeli police and security companies have trained the police force in Ferguson that killed Michael Brown, Rio’s infamous special police forces that carry out extrajudicial executions, and numerous other police forces, including in Los Angeles and London. Israeli companies sell military expertise to dictatorships in Asia and Africa, often to both sides of a civil war. The EU’s border management agency has hired drones from Israel Aerospace Industries to further securitize European borders. 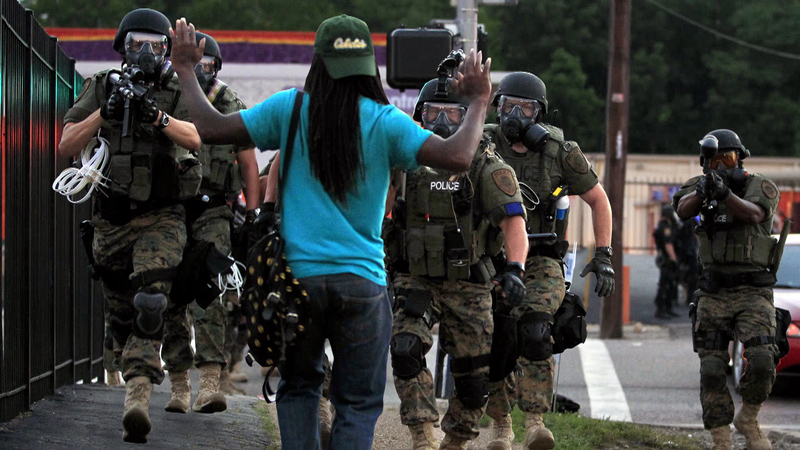 American police forces stop a Black man in Ferguson, Missouri. Israel’s largest private military company, Elbit Systems, shows how private companies play a pivotal role in Israel’s violent oppression of Palestinians. Elbit Systems supplies and maintains surveillance systems for Israel’s illegal wall and settlements built on stolen Palestinian land. It also supplies helicopters to the Israeli police. 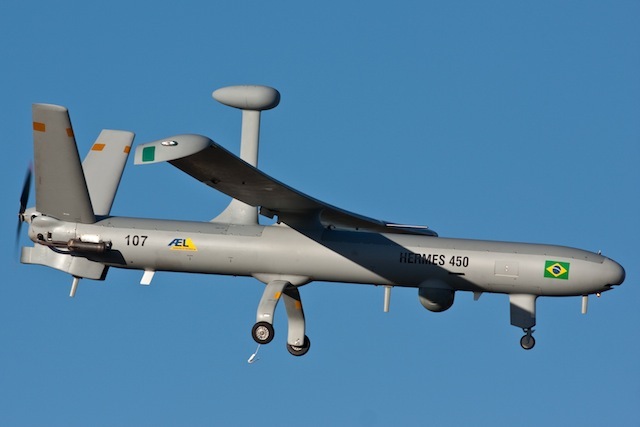 Elbit drones have been extensively “field tested” during Israel’s military assaults on Gaza. The company also produces white phosphorous. 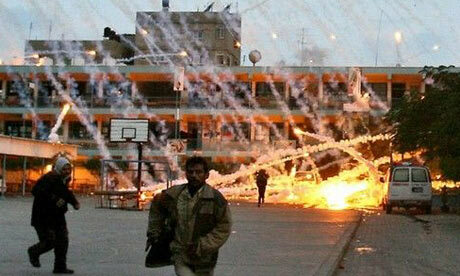 Israel has been condemned for its illegal use of white phosphorus during its attacks on Palestinians. After Israel’s 2014 massacre on Gaza, Elbit’s share price rose sharply. Elbit is also a key exporter of Israel’s repression to the world. The technology it developed to build Israel’s apartheid wall in the occupied West Bank, encaging Palestinian communities and stealing Palestinian land, is used in the US wall at the Mexico border. Elbit’s drones are used to surveil migrants in the United States and elsewhere. Although the #StopElbit campaign has achieved many victories worldwide, Elbit passed the $1 billion quarterly profit threshold for the first time in 2017. Click here to join a campaign against Elbit. The Palestinian BDS National Committee issued a call for a comprehensive military embargo on Israel in 2011. It asked governments, institutions and people to support ending military aid and weapons exports to Israel, ending the exchange of weapons and military technology to and from Israel, and ceasing all forms of military and security research cooperation. The call for a military embargo is now supported by major international human rights organizations, political parties, NGOs, trade unions and advocacy groups across the world. UN Security Council resolutions 465 (1980) and 2334 (2016) call on states to not recognize or assist Israel’s illegal settlements and annexation of occupied territory. The General Assembly passed resolution ES-9/1 for a comprehensive military embargo on Israel on Israel (1982). More than a dozen financial institutions have announced their divestment from Elbit Systems over its role in Israel’s military violence. 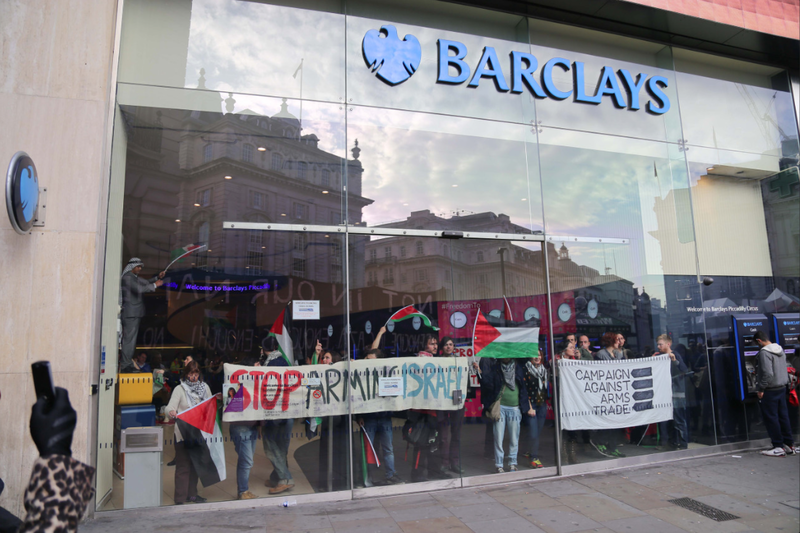 UK bank Barclays divested after more than 1.7 million people signed a petition and campaigners occupied and protested at bank branches across the UK. #StopElbit: Elbit’s participation in a Brazilian drone production was terminated in 2016. In 2014, the Rio Grande do Sul region decided to end a large-scale research collaboration project with Elbit Systems. Elbit has lost contracts in Denmark and France following public campaigns. In December 2018, HSBC has announced it divested from Elbit Systems after a sustained civil society campaign. An ongoing campaign urges AXA to drop their investments in Elbit. #StopG4S: G4S has lost contracts worth millions of dollars with unions, banks, charities, universities and other public bodies as a result of BDS campaigning. South Africa has nearly ended its military relations with Israel. The Norwegian government has an official policy of not exporting weapons to Israel. The Spanish State has denied some licenses for arms export to Israel. Portugal withdrew from an EU project with the Israeli police. The Brazilian government distanced itself from Israel’s security company ISDS. Rio Grande do Sul in Brazil cancelled a satellite program with Elbit Systems. Dozens of city councils, including the cities of Dublin and Barcelona, have endorsed a military embargo of Israel. In the United States, congresswoman Betty McCollum introduced legislation to end US funding for Israel's military detention of Palestinian children. She has also recognized that Israel is an "apartheid" state. "A comprehensive military embargo is a just response to Israel’s continuing intransigence to the world’s demand that it cease its extremely oppressive policies towards Palestinians." "Amnesty International is calling on the UN to immediately impose a comprehensive arms embargo on Israel"
"I endorse this call for an arms embargo because we desire peace and justice for Palestinians and Israelis through non-violent ways." "This much deserved military embargo is a crucial step towards ending Israel's impunity." Israel’s military-security industry depends on international cooperation, trade with governments, and research collaboration. 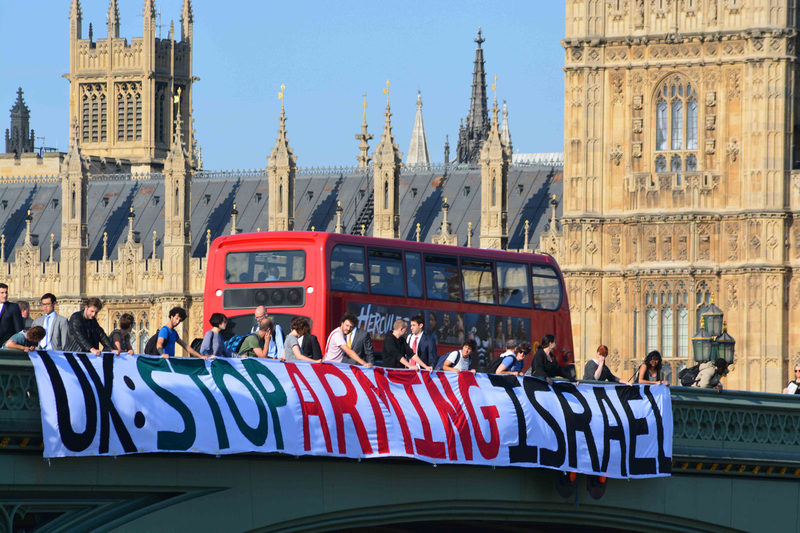 Grassroots campaigning is essential to impose a military embargo on Israel. Palestinian civil society has called for a comprehensive and immediate military embargo on Israel. BDS campaigning is starting to have an impact on Israeli military companies like Elbit Systems. Campaign for an end to military cooperation with Israel. Build pressure on your city, regional, or central government to exclude Israeli military companies from contracts for goods or services, and where applicable, to stop arming Israel. 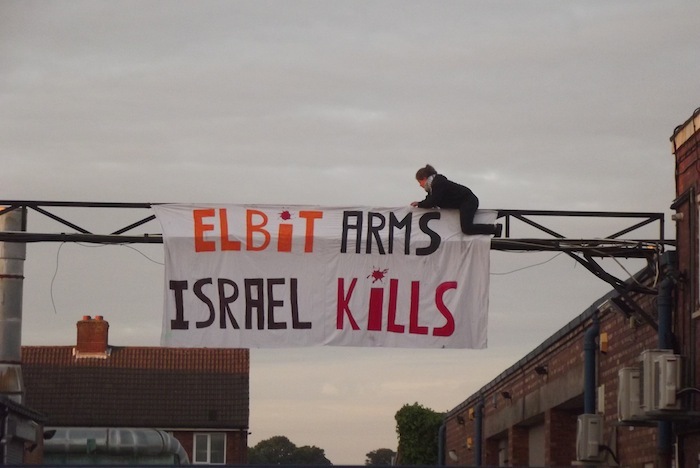 #StopElbit: Elbit has been a global campaign target since 2008. For more information, see here. #StopG4S - A global campaign pressured G4S, a British multinational that is the world's largest private security company, to end its contracts with the Israeli Prison System. G4S is still training Israel’s police force. For more information, see here. Organize mock checkpoints, raise awareness about Israeli repression demanding an immediate military embargo. Urge your union, university or local government to divest from, or terminate contracts with Israeli and other military and security companies that are complicit in Israel’s system of apartheid, military occupation and ongoing theft of Palestinian land. Make freedom of information requests, ask elected representatives to question local or federal governments about their military relations with Israel and Israeli military companies. Police forces around the world receive training or equipment from Israeli state institutions or private corporations. Campaigns like Deadly Exchange in the United States, campaigns in Rio de Janeiro (Brazil) and StopLawTrain in Europe work to end these lethal partnerships. Banks and pension funds that you are a customer of are likely to have collaboration with Israeli military companies or complicit corporations such as G4S and HP. Pressure them to divest. Universities and private entities around the globe profit from Israel’s military industry. Research cooperation with Israel’s military, police and militarized academic institutions is widespread and often publicly financed. Campaign to end military and security research cooperation with Israel. Universities across the world conduct joint military research with Israel or with weapons companies that supply the Israeli military. Campaign for them to cut their ties to Israel’s military industry! Peacefully protest the presence of Israeli arms producers and military companies that export weapons to Israel. Campaigners have blockaded Elbit factories. Activists in Colombia, Brazil, France, the UK and the Netherlands have protested arms fairs where Israeli companies and officials were present. Encourage unions, community organizations and political parties to campaign for a military embargo. Israel’s repressive tactics are used to oppress marginalized communities around the world. Form alliances and mutual solidarity with communities impacted by Israel’s repressive tactics. Together we are stronger and can build a better world for all.